2018 was an up and down year for Julen Lopetegui. The 52-year-old was sacked as Spain manager on the eve of the World Cup after announcing his intention to move to Real Madrid after the tournament. Just three months into his tenure at the Bernabeu, Lopetegui was dismissed after a run of five defeats in seven matches, culminating in a 5-1 thrashing by rivals Barcelona. In one of his first interviews since leaving Real, Lopetegui spoke to the BBC’s European football expert Guillem Balague about his turbulent year, the possibility of a move to the Premier League and the influence of Johan Cruyff on his management style. Listen to the full interview on the 5 live Football Daily podcast on Thursday. On 12 June 2018, two days before the start of the World Cup, it was announced that Lopetegui would be joining Real Madrid following the tournament. Lopetegui felt it was best to be open about the decision and end the speculation, allowing everyone to focus on the World Cup. The president of the Spanish Football Federation (RFEF), Luis Rubiales, saw differently and felt he had little choice but to sack Lopetegui because the negotiations had occurred behind the federation’s back. “It was not easy for me,” said Lopetegui. “We worked very hard for two years, we felt that we were ready to have a fantastic World Cup. “Two months previously, when I signed a new contract with Spain, they put a buyout clause in. It was [Luis] Rubiales’ idea, I agreed it with him no problem and then it [the Real Madrid job offer] happened. “The timing was not chosen by me or Real Madrid – I said yes, but I knew the World Cup was my only responsibility. To keep it secret for one month is impossible and was not honest. “We were convinced it was best to have a press conference to open and close the issue then, after that, the only focus was the World Cup. “The players were fantastic. After I told them, we had our best training session in the three weeks of our preparation so we were very happy but in the end the president took that decision. “It was a very hard moment and I will never forget it because it was a surprise. I felt it was very unfair. 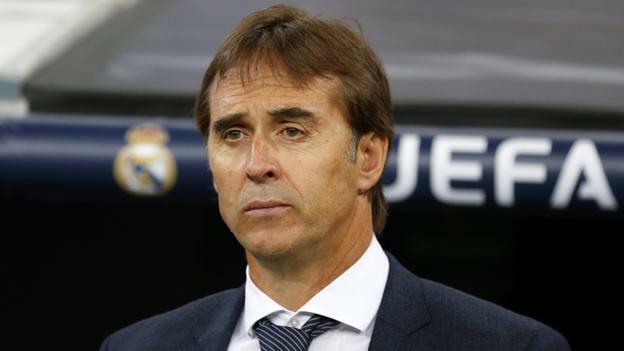 The day after his abrupt departure from Russia, an emotional Lopetegui struggled to hold back tears as he was introduced as Real Madrid’s new coach. “I didn’t sleep; I didn’t know where I was. One day I was in Russia training for the World Cup, the next I was in the Santiago Bernabeu with a new team,” he said. Lopetegui’s first game in charge was an extra-time defeat by Atletico Madrid in the European Super Cup but the team then responded with five wins in six matches, including a 3-0 victory against Roma in the Champions League. However, Real would go on to win just one of their next seven games and Lopetegui was dismissed on 29 October following that 5-1 defeat by Barca at the Nou Camp. “We had a good start, the team was playing well but then we had three very bad weeks,” he said. “You just hope you have time to find a solution because these things can balance out over a season. We were sure this situation was going to pass. Despite his early departure, Lopetegui insists he bears no ill-feeling towards the club. “I have all respect for the new coach [Santiago Solari], his new staff. And the players – I love them, they had a fantastic attitude with me. Is a move to the Premier League a possibility? Lopetegui has never managed outside of Spain and Portugal but with high-profile coaches including Pep Guardiola and Jurgen Klopp working in the Premier League, is he tempted to join them? “A coach needs to be open for the future, but if I can choose, I prefer to be in the best leagues,” he said. “England is a fantastic league. When you watch a match in England, you can feel the atmosphere, the respect for the players and the coaches, this is very important. I want to feel that. Lopetegui spent two years as a player working under Johan Cruyff at Barcelona, the Dutch legend who inspired a generation of coaches including Guardiola, Michael Laudrup and Ronald Koeman. “As soon as I had the first training session with Johan I thought ‘this is different to all other coaches’, he was brilliant. “He planted the seed for other coaches to take on his ideas and develop those ideas. He was one step ahead of the rest. You can hear the full interview with Julen Lopetegui on the Football Daily Podcast.